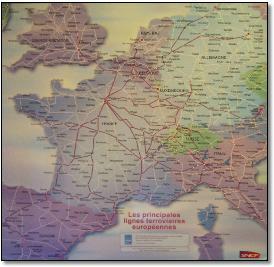 The only time I've seen a Railteam map is this insert on an SNCF geographic map on a TGV. 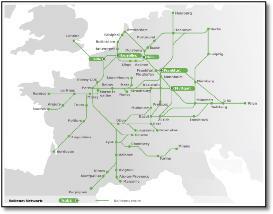 This map is more about explaining the network than the overall styling, although this is refreshingly different. 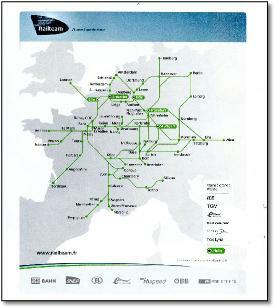 • Lines must radiate from Paris with all the individual stations shown. • The major geographical feature of the Rhine valley should look right, with south west and north west axis meeting at Frankfurt. 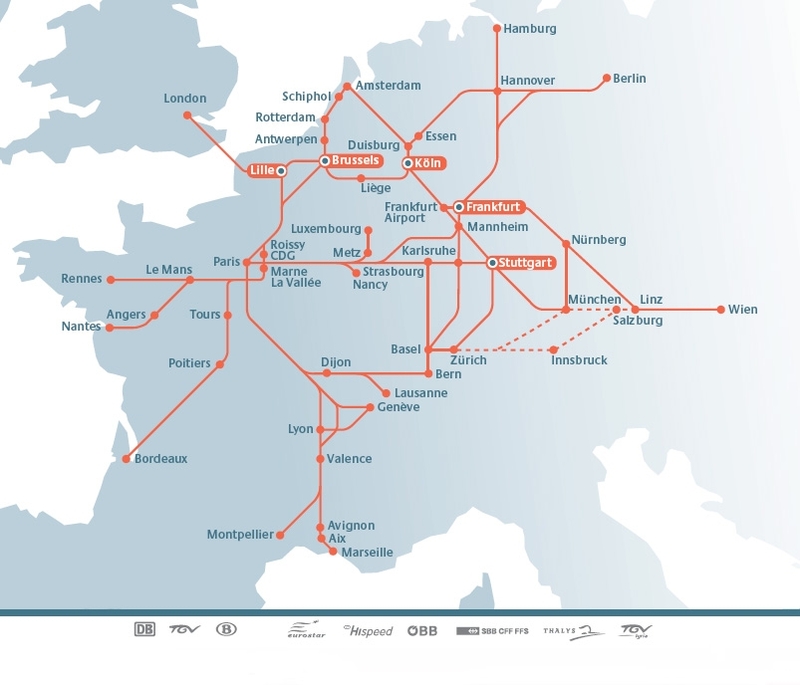 The bifurcation with the two major Frankfurt stations worked out well. 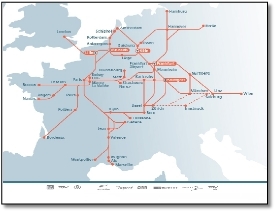 • The major horizontal (Paris-Strasbourg-Stuttgart axis) is quite difficult on the ground and doesn't justify a straight line on a map as this distorts other equally important routes. The gentle zigzag design through Karlsruhe is a good compromise. • PLM lines out of Paris bifurcate in a mirror-image. • Airport stations use a conventional plane symbol and are also shown in red. • Map is very efficient in terms of the space required to present the information - important as maps always eat into available space. 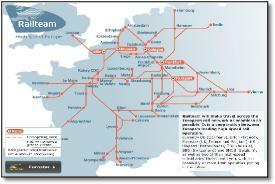 Captions are twice the size of the existing Railteam map. • Station names do not cross lines. Styling is different from other Project maps in the interest of pursuing new ideas. It's not easy to make a practical map look exciting - it is difficult to make three-dimensional solutions work, hence most maps are flat. This map should be on the Europe page, but it shows a diagrammatic version of the geographic map at the top. Aix-La-Chapelle changed to Aachen, Karlsruhe caption moved. Latest version has a key (covering Bordeaux) referring to lines opening soon - but they are shown open. 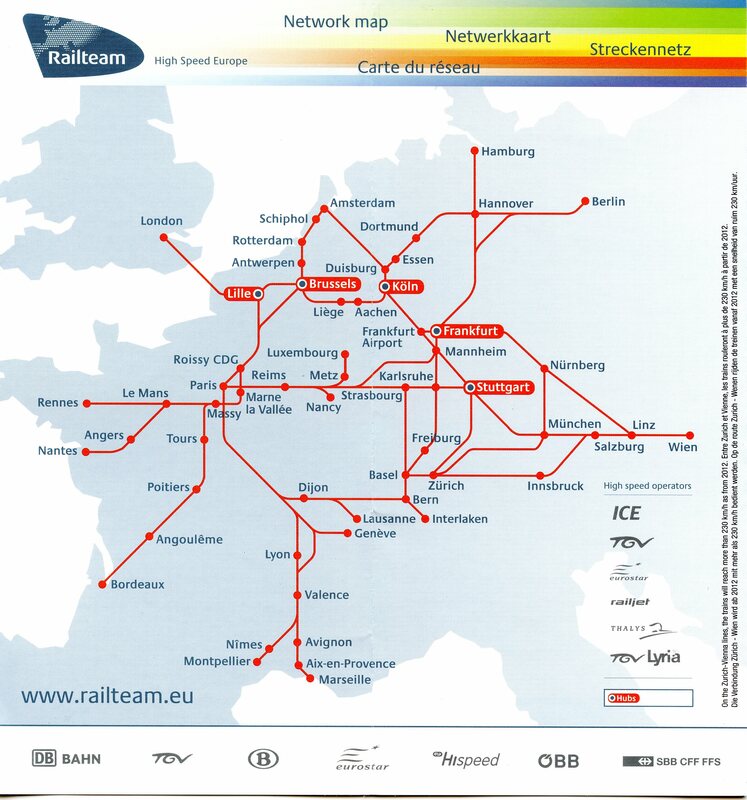 This map is a bit of a mystery as it is difficult to work out why the lines shown were selected, many high speed lines are omitted (for example Fulda-Würzburg) and the selection of secondary routes unclear (why south from Luxembourg but not north?). The function or selection of the hubs is unclear. 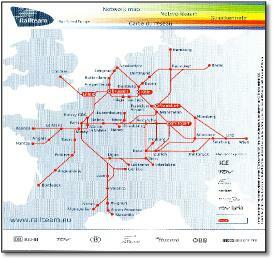 The map also includes the symbols/logos of the operating companies involved in Railteam (DB not ICE, but TGV not SNCF) so perhaps the lines could be colour coded (tube map style) to reflect this, but presumably the decision was taken to show all routes equal to market the seamless (operator-irrelevant) journey intended. But it’s early days and Railteam probably just wanted something for the launch. This map will be very hard to develop because of the difficulty in standardising on the coding, involvement by many marketing personel, political imperatives, etc. 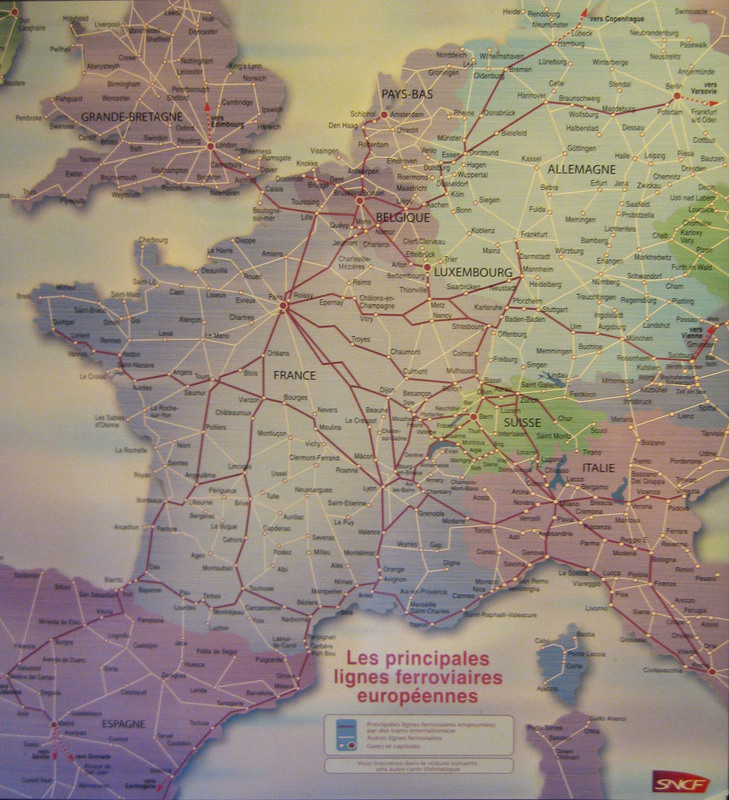 But it would be very exciting to develop a map of the european railways that worked at various levels with the high speed routes on the uppermost layer. 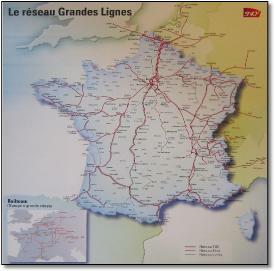 • Shows the Lyon by-pass but doesn't show its regional station. • Paris termini not shown, yet those on the Paris bypass are; it looks like trains from western France only go to Marne La Vallée although they do go to Paris. Even three 'blobs' would be truer. • Some lines bifurcate using a soft curve, others a sharp angle. 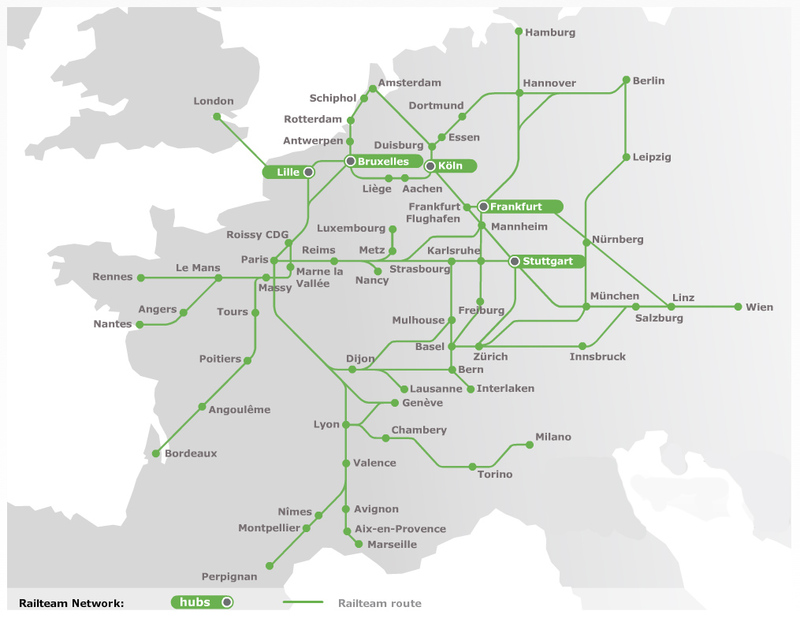 • Most angles are conventional 45º, but some are not, ie Basel-Karlsruhe/Zurich-Stuttgart not parallel - poor cartography. • Inconsistent presentation of airport names: Frankfurt 'Airport' but 'Roissy CDG" rather than Paris Roisssy CDG airport' and 'Schipol'. Why not use aeroplane symbol? 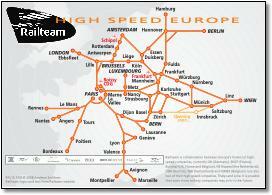 • Shows a direct Paris - Brussels line that doesn't exist. 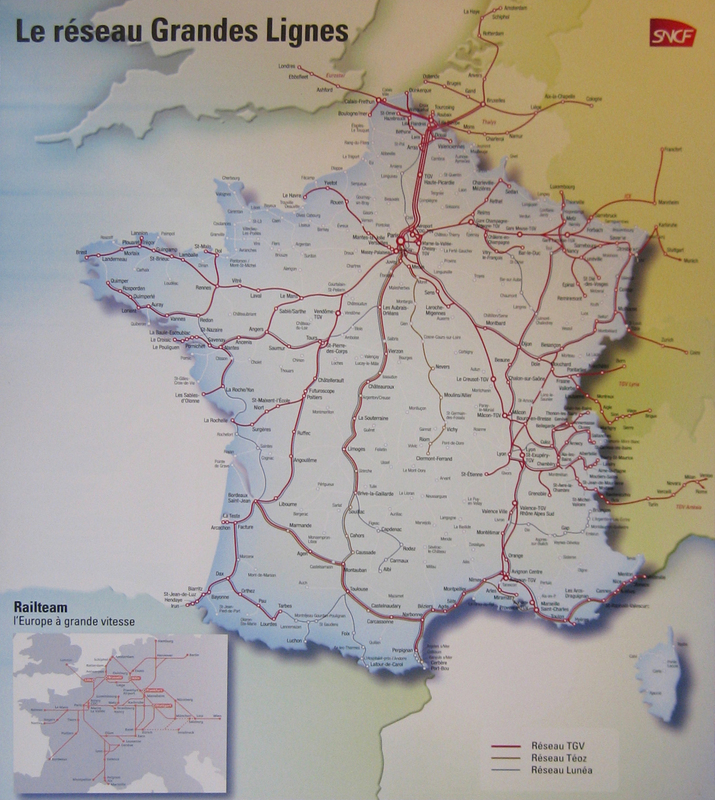 • Inconsistent station selection, eg shows Aix but not Ebbsfleet. Why not Kassel? 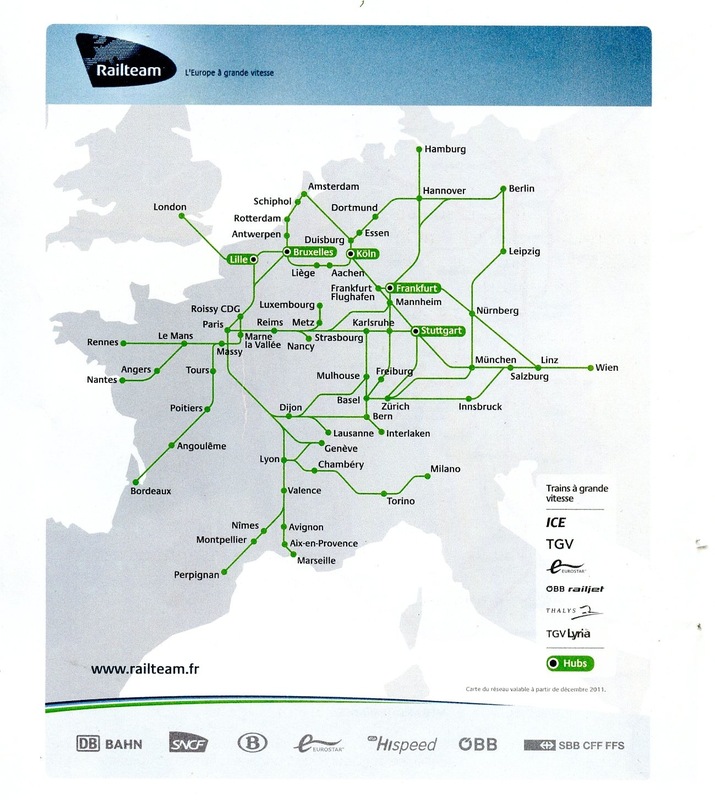 And Heidleberg on the route between Frankfurt and Stuttgart not shown. • Unnecessary distortion - Karlsruhe is north-east of Stuttgart not east. • Unnecessary dip on the major west-east line between Brussels and Koln. • A spurious line under Münich. 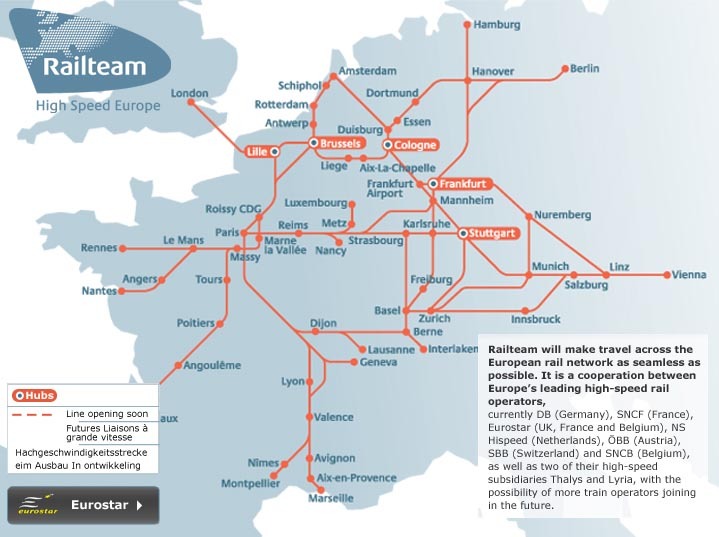 • Poor caption to station alignment, for example Strasbourg and Karlsruhe.